This subsection is the alluvial plain of Death Valley, from Sand Spring south-southeast to the drainage divide between Death Valley and Silurian Valley. It has a very hot arid climate. MLRAs 30g and 30h. This subsection contains mostly Quaternary alluvial fan, basin-fill, and lacustrine deposits. There is some dune sand on the east sides of playas. Small areas of Pliocene nonmarine sedimentary rocks are included in this subsection. This subsection contains predominantly nearly level lake plain and basin floor and gently to moderately sloping alluvial fans. There are some moderately steep slopes on upper fans and Pliocene sedimentary rocks. Beach ridges and strand-lines mark the edges of former lakes. The valley is oriented toward the north-northwest. 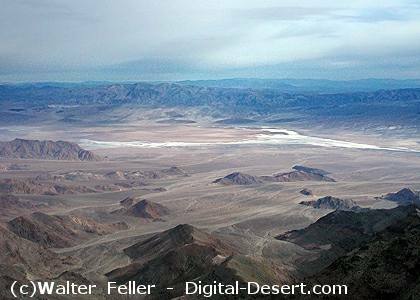 The elevation range is from -282 feet at Badwater up to about 4000 feet. Fluvial erosion and deposition and eolian deflation and deposition are the main geomorphic processes. The soils are mostly Typic Torrifluvents and Typic Torriorthents, but also Typic Torripsamments, Typic Haplocalcids, Typic Haplargids, and shallow Typic Haplodurids. Lithic and shallow Typic Torriorthents are common on Pliocene sedimentary rocks. The lake plains are mostly playas that have only recently become exposed on the surface and still lack vascular plant cover. The soils are well drained. The soil temperature regimes are mostly thermic, but hyperthermic on the basin floor in the center of Death Valley. Soil moisture regimes are aridic. The predominant natural plant communities on fans are Desert-holly series and, higher up the fans, Creosote bush series. 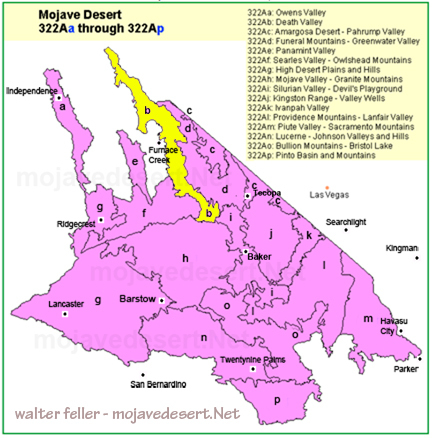 Desert-holly series is replaced by Allscale series toward the southern end of the valley. Brittlebush series and White bursage series are common in washes on the fans. The predominant natural plant communities on lacustrine deposits are Iodine bush series and Saltgrass series. Mesquite series and Arrow weed series are common around the edges of saltmarshes. Much of the dry lake plain is devoid of vascular plants, because of high salt content (ground water salt >6%). Grasslands: Desert sand - verbena series, Indian ricegrass series, Pickleweed series, Saltgrass series. Shrublands: Allscale series, Brittlebush series, Creosote bush series, Creosote bush - white bursage series, Desert-holly series, Iodine bush series, White bursage series. Climate. The mean annual precipitation is about 3 to 5 inches. It is all rain. Mean annual temperature is about 60° to 77° F. The mean freeze-free period is about 225 to 325 days. Surface Water. Runoff is rapid from alluvial fans and slow from basin-fill. Drainage is internal, there is no outlet for surface water. The Amargosa River, which is the largest stream draining into Death Valley, is dry most of each year; but it does have several large springs along its channel. There is temporary ponding on playas, or dry lake beds.